One piece of gear that has saved me over and over again is what I consider to be my lifeline for my cell phone. I have an iPhone 3GS (holding out for iPhone 5!) 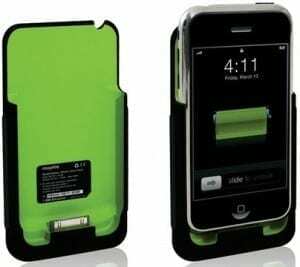 and use a Mophie Juice Pack to re-charge my cell phone on long trips and long days. Since the days of my Mophie (I have the one in the photo) they have come up with sleeker designs with a thinner form factor, but for me it is the functionality that provides the magic. I have used it on long-haul flights and cross-coast domestic flights. Once my iPhone battery is dead this powerful piece of gear re-charges my phone completely (and most times more!). It is easy to use, I charge it up using a USB and once it is full, I carry it in my carry-on (or my purse) so that I can slide my phone into it when needed. This little gem has also saved me when I am at tradeshows, blogging conferences and other long days with long meetings when I can’t get to a charger and I highly recommend it! How about you? Do you have a cell phone accessory that you can’t live without? Never heard of this before, but it certainly would have come in handy when I was using my iPhone in France! I’m holding out for the iPhone 5 as well–so maybe I’ll buy one of these too! @Christine, it is really great. I hope I make it until the 5, my 3 if dying, the last 4-5 days it has started crashing constantly! @Cathi, you’re welcome, I can’t live without it! I don’t have any cool gadgets, but if I splurge that will be the one. How fabulous and great color. I love your practical tips and wonderful little tidbits. @Walker, thanks! Seriously, if I could only buy one gadget this would be it! Cool tip…I will buy one after I get the iPhone 5 — I have a small charger that my cousin got me in Japan, but it only charges enough to make a couple calls when your phone is dead..
@Sharon, it is really great!